For other uses, see Last stand (disambiguation). A "last stand" is a last resort tactic, and is chosen because the defending force realizes or believes the benefits of fighting outweigh the benefits of retreat or surrender. This usually arises from strategic or moral considerations, such as staying and fighting to buy time for wounded soldiers or civilians to get to a safe place, leading defenders to conclude that their sacrifice is essential to the greater success of their campaign or cause, as happened at the end of the Battle of Saragarhi. The situation can arise in several ways. One situation is that retreat by the defending force would lead to immediate defeat, usually due to the surrounding geography or shortage of supplies or support, as happened to the Royalist infantry on Wadborough Hill after the Battle of Naseby. Custer's last stand in the Montana Territory, United States in 1876 as depicted in a painting by Edgar Samuel Paxson. The Shangani Patrol -- The last stand of Major Allan Wilson, Matabeleland, 4 December 1893. Some military thinkers have cautioned against putting an opposing force into a last stand situation, recognising that trapped men will fight harder. Sun Tzu wrote: "To a surrounded enemy, you must leave a way of escape". Similarly, they have sometimes suggested deliberately putting their own forces in such a situation, for example by burning boats or bridges that could tempt them to retreat. The historian Bryan Perrett suggests that although the majority of last stands throughout history have seen the defending force overwhelmed, on rare occasions the outnumbered defenders succeed in their desperate endeavours and live to fight another day, and he lists the Battle of Agincourt and the Battle of Rorke's Drift as such engagements. Troops may fight a last stand if they believe that they will be executed if they surrender. In Custer's last stand, at the end of the battle, the extent of the soldiers' resistance to the Native Indian warriors indicated they had few doubts about their prospects for survival if they surrendered. In the end, the hilltop where George Armstrong Custer's remaining troops made their last stand made it impossible for Custer's men to secure a defensive position. Nevertheless, the soldiers put up their most dogged defence, and died fighting. During the Warsaw Ghetto Uprising, by the end of 1942, the Jews trapped in the Warsaw Ghetto learned that the deportations were part of an extermination process, as the deportees were sent to death camps. Many of the remaining Jews decided to revolt. The first armed resistance in the ghetto occurred in January 1943. On 19 April 1943, Passover eve, the Germans entered the ghetto. The remaining Jews knew that the Germans would murder them all and they decided to resist the Germans to the last, rather than surrender. Another example of a famous last stand was during the First Battle of Mogadishu, where two US 1st SFOD-D snipers, MSG Gary Gordon and SFC Randy Shughart, protected the crash site of helicopter 'Super 6-4' and injured pilot Mike Durant, whom they feared would be executed by a crowd of deadly rioters. The two snipers killed 25 and wounded dozens more before they ran out of ammunition and were killed. Their defense, however, allowed Mike Durant to survive long enough for one of the local warlords to take him prisoner. The US was ultimately able to arrange for his release and he was returned home. For their actions, MSG Gordon and SFC Shughart were posthumously awarded the Medal of Honor. In some cases, troops will make a last stand to protect their ruler or leader. When Rome was attacked in 1527 by the army of the Holy Roman Empire under Emperor Charles V, over 20,000 troops stormed the city. The 189 Swiss Guards made a last stand against the massive army by forming a square around St. Peter's Basilica to give Pope Clement VII time to escape through secret tunnels, and held the doors until Clement could escape. In the Battle of Hastings in 1066, Saxon King Harold II battled the Norman William the Conqueror, who invaded with 7,000 men. After most of the Saxons were killed in the battle, "Harold and his housecarl bodyguard...fought on until an arrow struck the king in the eye." After Harold died, the housecarl bodyguard made a last stand and "...fought to the death around the body of their dead king." At the 1795 battle of Krtsanisi, where the Persian army led by Agha Muhammad Khan defeated the Georgians, the Three Hundred Aragvians - a detachment of the highlanders from the Aragvi valley - loyally fought and died in order to enable the escape of king Heraclius II, for which they are remembered as national heroes and were canonized by the Georgian Church. During the second Persian invasion of Greece the Greeks hoped to use the narrow pass of Thermopylae to prevent the vastly large army of the Persians from outflanking them. A Greek force of 7,000 men marched north to block the pass in the middle of 480 BC. The Persian army, ranging between about 100,000 and 150,000, arrived at the pass in late August or early September. During the Battle of Thermopylae, the vastly outnumbered Greeks held off the Persians for seven days (including three of battle) before the rear-guard was annihilated in one of history's most famous last stands. During two full days of battle, the small force led by Leonidas blocked the only road by which the massive Persian army could pass. 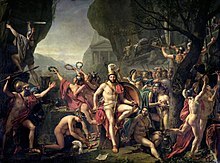 When Leonidas became aware that his force was being outflanked, he dismissed the bulk of the Greek army and remained to guard their retreat with 300 Spartans, 700 Thespians, 400 Thebans, fighting to the death. Although the Greeks lost the battle it did check the advance of the Persian army and the delay may have helped the Greeks prepare a successful defence and ultimately win the war. Sometimes, rather than face annihilation at the hands of a pursuing victorious army, a rearguard will be tasked by the commander of the defeated army with hindering the advance of the victorious army. Even if the rearguard is destroyed in a last stand, its sacrifice may buy their commander time to disengage without losing the majority of his army as happened during the Battle of Roncevaux Pass (778), and the Dunkirk evacuation (1940, in World War II). 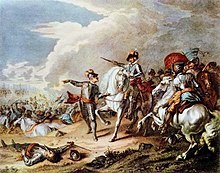 A last stand may also be the last pitched battle of a war where the position of the defending force is hopeless but the defending force considers it their duty not to surrender until forced to do so, as happened to the last Royalist field army of the First English Civil War at the Battle of Stow-on-the-Wold. At the Battle of Saragarhi, the British Indian contingent consisting of 21 Sikh soldiers of the 36th Sikhs, when faced with insurmountable opposition of 10,000 Afghans, decided to make a last stand in accordance with their traditional and religious belief that duty is above all convictions. All 21 Sikhs were killed, together with approximately 600 Afghans. A siege may lead to a last stand by the defenders (see for example the Battle of the Alamo). Last stands at the end of sieges became less common after the Hague Conventions came in force. 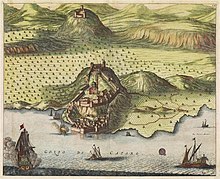 Before the 20th century, if a besieged garrison refused any offered terms of surrender and the attackers subsequently breached the defences, the defenders were only given quarter at the discretion of the attackers, something they were not likely to do if they perceived that by holding out, with no hope of relief, the defenders had needlessly squandered lives. Under the laws of war as they are now "...it is especially forbidden - ... To kill or wound an enemy who, having laid down his arms, or having no longer means of defence, has surrendered at discretion; [and] To declare that no quarter will be given ...", it is unlawful for an attacking force to kill a garrison if they attempt to surrender even if it is during the final assault on a fortified position. Long before Custer died at the Little Bighorn, the myth of the Last Stand already had a strong pull on human emotions, and on the way we like to remember history. The variations are endless — from the three hundred Spartans at Thermopylae to Davy Crockett at the Alamo — but they all tell the story of a brave and intractable hero leading his tiny band against a numberless foe. Even though the odds are overwhelming, the hero and his followers fight on nobly to the end and are slaughtered to a man. In defeat the hero of the Last Stand achieves the greatest of victories, since he will be remembered for all time. ^ "last stand - Definition of last stand in English by Oxford Dictionaries". Oxford Dictionaries - English. ^ Rollin, Charles (1804). The ancient history of the Egyptians, Carthaginians, Assyrians, Babylonians, Medes and Persians, Macedonians, and Grecians. 3 (10 ed.). Printed for W. J. & J. Richardson. p. 34. ^ "Warsaw Ghetto Uprising". United States Holocaust Memorial Museum. Retrieved 18 May 2014. ^ "January 1943: The First Armed Resistance in the Ghetto - Holocaust Survivors Describe the Last Months in the Warsaw Ghetto – Voices from the Inferno - Yad Vashem". www.yadvashem.org. ^ "Fighters in the Warsaw Ghetto - Holocaust Survivors Describe the Last Months in the Warsaw Ghetto – Voices from the Inferno - Yad Vashem". www.yadvashem.org. ^ "10 Heroic Last Stands from Military History - Listverse". listverse.com. 28 August 2009. ^ Sacks, Kenneth (2003). Understanding Emerson: "The American scholar" and his struggle for self-reliance. Princeton University Press. p. 157. ISBN 978-0-691-09982-8. ^ Cassin-Scott, Jack (1977). The Greek and Persian Wars 500-323 B.C. Osprey. p. 11. ISBN 978-0-85045-271-6. ^ Cummins, Joseph (2011). History's Greatest Wars: The Epic Conflicts that Shaped the Modern World. Fair Winds Press. p. [=https://books.google.com/books?id=eTdiDZjckzEC&pg=PA13 13]. ISBN 978-1-59233-471-1. ^ John Harris, Dunkirk: "the storms of war", David & Charles, 1980, ISBN 0-7153-7857-0, ISBN 978-0-7153-7857-1. p.8 "Dunkirk was a military operation also — a hard-fought retreat with a magnificent last stand by the rearguard to allow the bulk of the troops to get [away]"
^ Sidney Low, et al., The dictionary of English history, Cassell and company, 1928. "At the battle of Naseby Astley commanded the infantry, and in 1646 he made a last stand at Stow-on-the-Wold against the Parliament." ^ Gunderson, Cory Gideon (2004). The battle of the Alamo. ABDO. p. 15. ISBN 1-59197-278-7. ^ Philbrick, Nathaniel. The Last Stand: Custer, Sitting Bull, and the Battle of the Little Bighorn. New York: Viking Books, 2010, p. xvii.